Knesset committee approves deducting compensation for Gaza kite fires from money transferred to Palestinian Authority. Israeli Prime Minister Binyamin Netanyahu on Monday praised the Knesset's Foreign Affairs and Defense Committee for approving for Knesset vote his suggestion to deduct the cost of damage from Gaza-sparked fires from the payments transferred to the Palestinian Authority. Last week, Netanyahu instructed Meir Shabbat, chief of Israel’s National Security Council, to deduct money from the taxes collected by Israel on behalf of the Palestinian Authority. At least five million shekels in damage have been caused by Gazan rioter-terrorists sending kites attached to firebombs into Israeli territory. 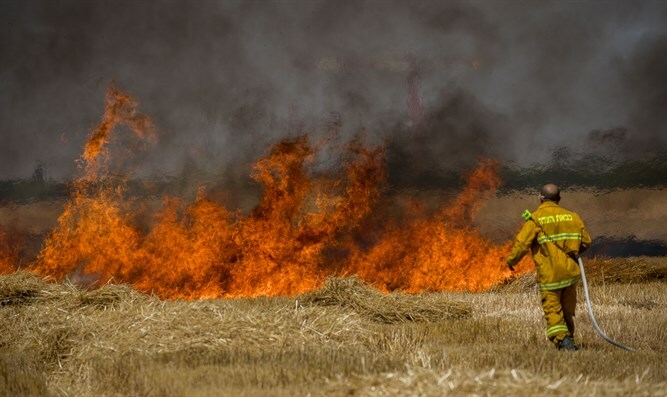 Last week, Gazan terrorists burned 75 acres in a single day. On Saturday alone, the terror kites sparked 17 fires. "Justice needs to be done," Netanyahu said. "Anyone who burns fields should know that there is a price." The Committee approved the suggestion as part of the bill to deduct payments made to terrorists and their families from funds transferred by Israel to the Palestinian Authority. According to the bill, the Israeli government will not have an option to cancel or freeze the deductions. MK Elazar Stern (Yesh Atid) said, "This law corrects a historical injustice. This law will reduce terror. it is a law which is in line with the most basic moral values humankind holds. It's not clear why it wasn't legislated until today." "I have no doubt that it will reduce terror and raise the chance of peace." Committee Chairman MK Avi Dichter (Likud) said, "Today we have made history. The State of Israel will not be a pipeline to transfer terror funds to terrorists. Our mission and our job is to ensure the security of Israel's citizens, and to take whatever steps necessary to reduce the terror against us, including by deducting funding. The absurdity is over."